Today I had a little surprised as stars appeared around my mouse pointer and they remained. I was pretty sure I've seen those before so not too much to worry about, but... how to get rid of them?! I knew that I just hit something on the keyboard, I just don't really know what the keystroke was. 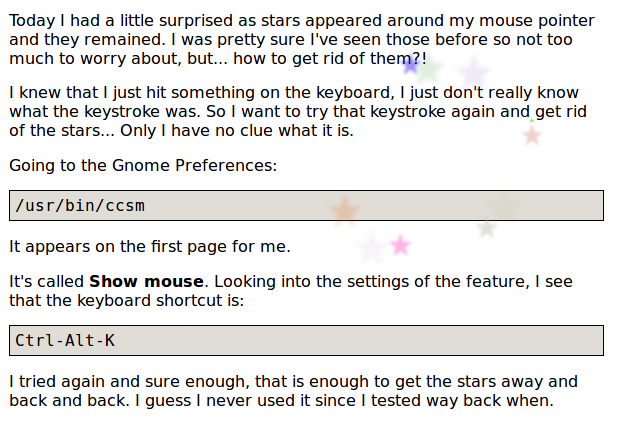 So I want to try that keystroke again and get rid of the stars... Only I have no clue what it is. It appears on the first page for me. I tried again and sure enough, that is enough to get the stars away and back and back. I guess I never used it since I tested way back when. How do I know whether a server sends Keep Alive signals over a TCP connection? How do you force the size of a C/C++ struct to a given size? FATAL: The application binary appears to be running setuid, this is a security hole. Testing a service on my developer computer, how to make it work.